The five large-scale maps of Monster Hunter: World run the gamut of natural order, from the crisp flowing streams in the Ancient Forest to the giant jagged bone swamps of the Rotten Vale, each populated with their own scaly terrors for players to strike down. That’s not to mention the number of special areas, the long list of challenges to complete, and the optional Arena quests to tackle. With all that, you’d think players would have a hard time running out of things to do. 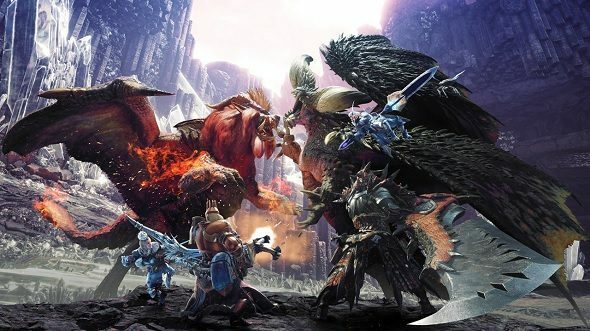 But after hundreds of hours of being on the prowl, some hunters have put their own spin on Capcom’s blockbuster adventure – finding new ways to challenge themselves outside of the confines of the game. From going back to hunting fundamentals to putting a twist on group hunts, these are strategies you can use to mix up the action when the creature feature comes to PC. Here are the best Monster Hunter: World late-game builds. 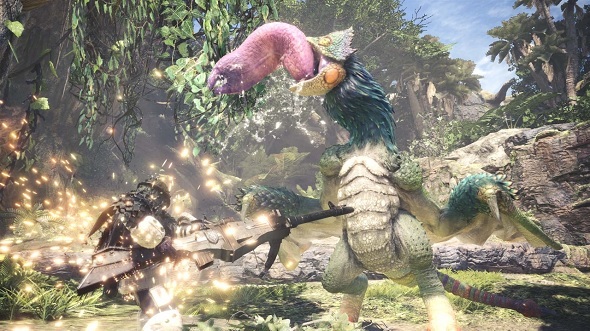 The core cycle of every Monster Hunter game has been to hunt monsters, collect their materials, and craft stronger gear with those materials in order to hunt bigger creatures. It’s what makes Monster Hunter such a satisfying series. Grind those smaller lizards in order to get tougher weapons feels so worthwhile once it enables you take out that pesky Anjanath that’s been causing you so much trouble. For some players, putting restrictions on their runs with challenges isn’t enough – some need to let chance decide who, how, and what they’ll hunt by using a roulette wheel. A few Twitch streamers put together a wheel for weapons, monsters, and challenges to spice up hunts. This forces them to rely on their base skills rather than the strength of a favourite weapon or skill set. Before they start a hunt, these hunters spin each wheel to determine what they’ll be doing. If any result doesn’t fit together, like a single monster hunt with a three-monster challenge, they spin again. After hundreds of hours in the fray, you’d think most hunters would be experts at taking down everything from the Anjanath to the Barroth. But most of these veteran players have only scratched the surface when it comes to hunting efficiently, especially if you’re talking speed running. Speedrunning is one of the ultimate ways hunters challenge themselves outside the normal roadblocks that the game puts in front of you. Going for the best time requires the optimal use of items, like using the rocksteady mantle to avoid getting shaken by tremors caused by a monster, or using the flash bomb to knock monsters out of the air. Monster Hunter: World throws a whole new wrench into the mix when compared to previous games in the series, too, since learning the monsters patterns becomes that much harder when the environment can be different each time you jump in. You never know if another monster will jump into your duel at anytime during the original scuffle, adding an extra layer of possibilities to consider. As with most leisure activities, monster hunting is far more fun when done in groups. And even though the monsters’ health is tripled when more players enter the battle, the overall difficulty can drop a bit when more swords are swinging. That’s why some hunters mix in an extra challenge with what they call last man standing. The rules are simple: you’re out of the running once the monster sends you back to camp on a cart when you’re playing in a group match. The last hunter standing against the beast takes bragging rights home that round. Last man standing therefore introduces a competitive element to what is meant to be a strictly co-op hunt – making it almost like a new mode altogether. There are many other, and likely harder, variants on this approach to hunting to be discovered, and as veterans keep learning about the game, attaining better mastery of its challenges, we will continue to see them emerge.